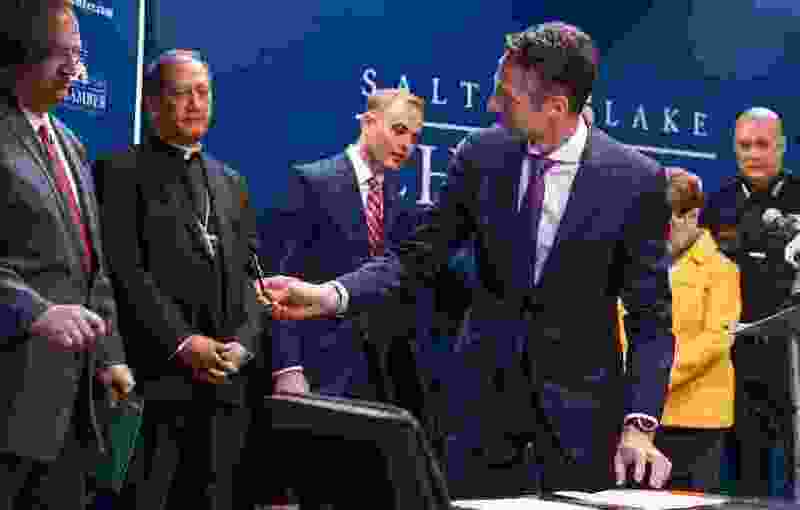 (Leah Hogsten | The Salt Lake Tribune) Derek Miller, right, president and CEO of the Salt Lake Chamber, passes a pen to the city's business and civic leaders who gathered Thursday to sign the Utah Compact, initially adopted in 2010. The compact emphasizes humane treatment of immigrants, keeping families together and focusing deportation on serious criminals. Nearly a decade ago, when Utah immigration arguments grew vitriolic, a group of religious, civic and business leaders signed the Utah Compact. 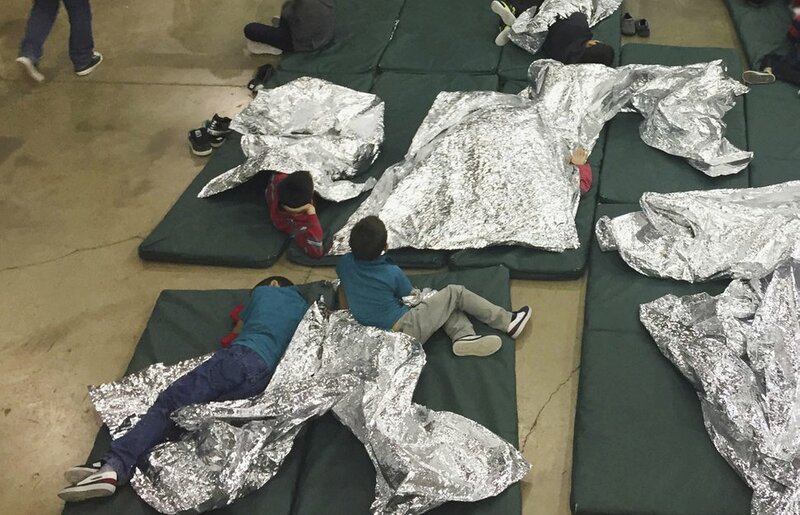 The document sought to cool debate by emphasizing humane treatment of immigrants, keeping families together and focusing deportation on serious criminals — an approach numerous other states later copied. Immigration debates remain bitter, so the same groups gathered Thursday to sign the compact again to reaffirm that its principles could calmly help find solutions amid hot debates on everything from a wall along the Mexico border to immigrant detainment and whether immigrants who arrived as children should be allowed to remain. 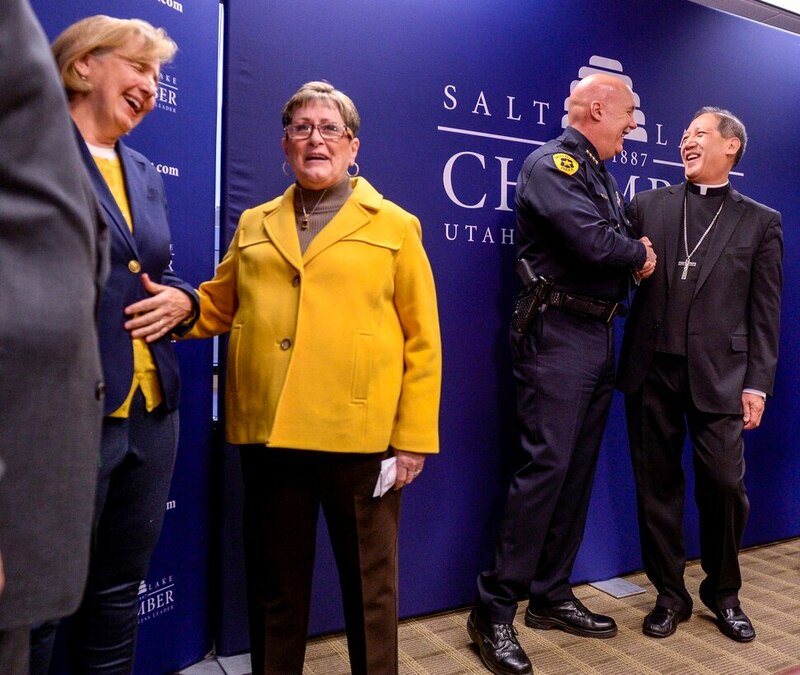 Leah Hogsten | The Salt Lake Tribune l-r Mike Brown, Chief of the Salt Lake City Police Department shares a laugh with Bishop Oscar A. Solis, leader of Utah's Catholic community after the two signed The Utah Compact, Thursday reaffirming the principles initially adopted in 2010. The compact emphasizes humane treatment of immigrants, keeping families together and focusing deportation on serious criminals. Leah Hogsten | The Salt Lake Tribune Derek Miller, right, President and CEO of the Salt Lake Chamber passes a pen to the city's business and civic leaders who gathered Thursday to sign the Utah Compact, initially adopted in 2010. The compact emphasizes humane treatment of immigrants, keeping families together and focusing deportation on serious criminals. Leah Hogsten | The Salt Lake Tribune Salt Lake City business and civic leaders gathered Thursday to reaffirm the principles of The Utah Compact, initially adopted in 2010. The compact emphasizes humane treatment of immigrants, keeping families together and focusing deportation on serious criminals. 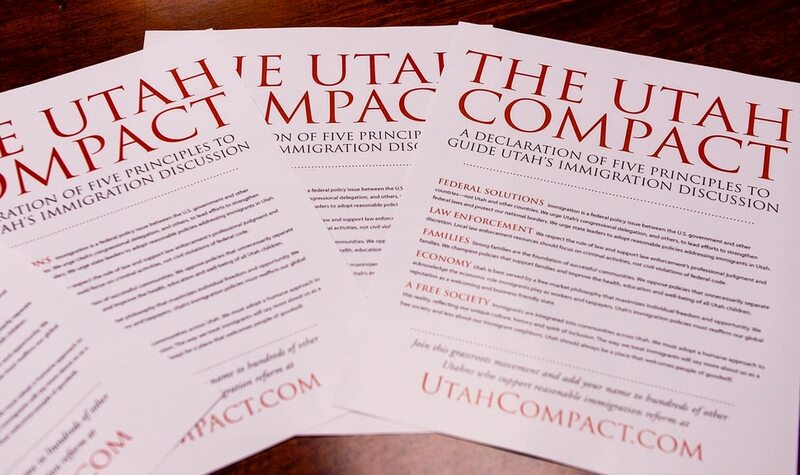 Leah Hogsten | The Salt Lake Tribune Today, nearly a decade later, our immigration system is still in need of significant reform, said Derek Miller, President and CEO of the Salt Lake Chamber, holding a copy of The Utah Compact. City business and civic leaders gathered to sign the compact, initially adopted in 2010. The compact emphasizes humane treatment of immigrants, keeping families together and focusing deportation on serious criminals. Leah Hogsten | The Salt Lake Tribune Strong families are the foundation of successful communities, said Bishop Oscar A. Solis, leader of Utah’s Catholic community. That is why we oppose all policies that unnecessarily separate families. We champion policies that are supportive of families, that contribute to the welfare and well-being of all children. Salt Lake City business and civic leaders gathered Wednesday to reaffirm the principles of the Utah Compact, initially adopted in 2010. The compact emphasizes humane treatment of immigrants, keeping families together and focusing deportation on serious criminals. Leah Hogsten | The Salt Lake Tribune Salt Lake City business and civic leaders gathered Thursday to reaffirm the principles of The Utah Compact, initially adopted in 2010. The compact emphasizes humane treatment of immigrants, keeping families together and focusing deportation on serious criminals. Leah Hogsten | The Salt Lake Tribune Strong families are the foundation of successful communities, said Bishop Oscar A. Solis, leader of Utah’s Catholic community. That is why we oppose all policies that unnecessarily separate families. We champion policies that are supportive of families, that contribute to the welfare and well-being of all children. Salt Lake City business and civic leaders gathered Wednesday to reaffirm the principles of the Utah Compact, initially adopted in 2010. The compact emphasizes humane treatment of immigrants, keeping families together and focusing deportation on serious criminals. Leah Hogsten | The Salt Lake Tribune The Utah Compact signed nearly a decade ago, by then Governor Olene Walker and many religious, civic and business leaders. On Thursday, a new generation of business leaders, community leaders, faith leaders, elected officials, educators and all Utahns were invited to visit UtahCompact.com and add their names. The compact emphasizes humane treatment of immigrants, keeping families together and focusing deportation on serious criminals. One group that was visibly absent was The Church of Jesus Christ of Latter-day Saints. In 2010, the state’s predominant faith opted not to sign the compact but issued a news release endorsing it. FEDERAL SOLUTIONS • Immigration is a federal policy issue between the U.S. government and other countries — not Utah and other countries. We urge Utah’s congressional delegation, and others, to lead efforts to strengthen federal laws and protect our national borders. We urge state leaders to adopt reasonable policies addressing immigrants in Utah. LAW ENFORCEMENT • We respect the rule of law and support law enforcement’s professional judgment and discretion. Local law enforcement resources should focus on criminal activities, not civil violations of federal code. FAMILIES • Strong families are the foundation of successful communities. 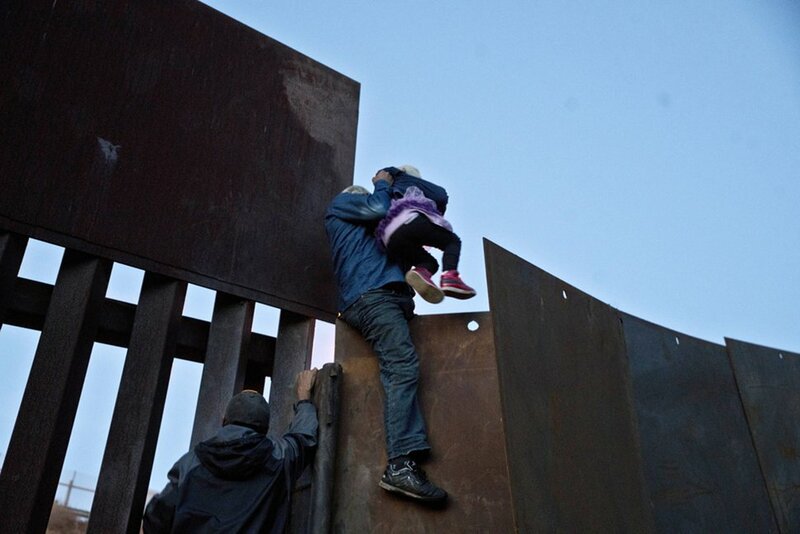 We oppose policies that unnecessarily separate families. We champion policies that support families and improve the health, education and well-being of all Utah children. ECONOMY • Utah is best served by a free-market philosophy that maximizes individual freedom and opportunity. We acknowledge the economic role immigrants play as workers and taxpayers. Utah’s immigration policies must reaffirm our global reputation as a welcoming and business-friendly state. A FREE SOCIETY • Immigrants are integrated into communities across Utah. We must adopt a humane approach to this reality, reflecting our unique culture, history and spirit of inclusion. The way we treat immigrants will say more about us as a free society and less about our immigrant neighbors. Utah should always be a place that welcomes people of goodwill. Other officials lined up at the event Wednesday to praise the compact's principles, and sign it again. Bishop Oscar A. Solis, leader of Utah’s 300,0000-plus Catholics, said the Diocese of Salt Lake City opposes separation of immigrant families and champions policies that benefit all children — including immigrants. The Utah National Guard has built walls along the Mexican border. The job helped shape the immigration views of some soldiers. Immigration attorney Timothy Wheelwright pointed to the compact’s first principle that stresses immigration is a federal issue that must be solved primarily by Congress. Salt Lake City Police Chief Mike Brown heralded the compact principle that says local law enforcement resources should focus on criminal activities, not civil violations of federal code such as undocumented immigration. Miles Hansen, president and CEO of World Trade Center Utah, noted a compact principle that said immigrants play an important economic role here. Paula Green Johnson, board member of the United Way of Salt Lake, praised the compact’s call for a humane approach to immigrants. Amid the speeches and signing, Envision Utah CEO Robert Grow said, “I hope we don’t have to come back here in 10 years and sign it again” and that the immigration battles soon will be resolved.